While watching HALLOWEEN on DVD, I passed out candy to the neighborhood Trick-or-Treaters. Yeah, I really watched HALLOWEEN! But, anyways, by my calculations I saw more Spider-Mans than Supermans and Batmans combined! Spidey has taken his rightful place as the World's Greatest SuperHero, far as I'm concerned. I did see one kid wearing a Hellboy costume, which I though was really cool! Sure, Mike Mignola is rightly acknowledged as a master of comics storytelling, with the awards and portfolio to prove it. His hit movie is due for a sequel, and his animated series is currently airing, I believe. But to see a kid walk up to my front door in a store-bought Hellboy costume, well, that clinches it! Mike's creation has hit the All-American folk tradtion of Halloween! I often get really ticked off when I hear people claim that Dia de Los Muertos is the Mexican Halloween. Grrrr...Jav Smash! I'll talk about the festival on my next post, but Day of the Dead is officially celebrated on November 2. The Hollywood Forever ceremony, like the many other events in LA, is held the weekend before only because there are so many other Day of the Dead events going on in the weeks leading to the actual event date, and in some cases even after. Here's a little secret: Wanna know where the idea for El Muerto comes from? See, folks have been dressing up in similiar outfits for years in honor of Day of the Dead. When I was thinking of a design for Muerto, spandex or leather didn't come to mind, but a good old-fashioned mariachi outfit and a stylized skull-face. So when I hear people compare my character to The Crow, I just have to think that people don't know enought about this wonderfully creative holiday. Who knows, maybe this father and child were inspired by El Muerto! I love a good old-fashioned Halloween, and the fact that two days later it's followed by Dia de Los Muertos, well, that's just an early Christmas present! Well, we've just had our first official Day of the Dead celebration in Whittier. Held in the historic Uptown section, the festival provided the community with vendors, artists, and musicians celebrating the uniquely Mexican fiesta of Dia de Los Muertos. While the actual holiday is November 2, because there are so many locations holding their own celebrations in the weekends leading up to the actual date, they decided to get a jump on it! Next week there are at least 3 festivals that I know of, including the gigantic bash at the Hollywood Forever bash cemetery. But tonite was Whittier's night. Here's a shot of one of the altars on display. They actually closed off the main street, Greenleaf, for the length of the whole block. At the center of the pic, you can see some of the Whittier hills. Behind the hills to the left would be the world famous Rose Hills Mortuary (where they filmed the big cemetery shoot-out for Terminator 3). Just beyond Rose Hills would be Rio Hondo College, where I attended a few years out of high school. Coincidentally, El Muerto star Tony Plana teaches a drama class there. In fact, when I called him about 2 weeks ago, he was actually driving to class from an El Muerto screening he was attending! My friend Janelle asked me to sign at her store, LunaSol Books, for which I was more than happy to do. Her store is one block over from Greenleaf, where the festival was held. She's located between a corner restaraunt and an art gallery. So, we figured there would be a lot of foot traffic, which there was. Plus, her shop is kinda small, and the weather outside was beautiful. So I ended up setting up outside her shop! Turned out to be a good idea. Besides the comics and buttons, I had a new item I was selling. The first edition of what I plan will be an annual tradition: An El Muerto Day of the Dead print! This year's batch is an 8.5" x 11" glossy print created on the computer in Illustrator. I really love the way clean, sharp vector art looks. It has an animation-cel look to it, and this image just came to me really quick. I only made 30 of these, signed and numbered. As usual, LunaSol Books proved to be a great place to meet very interesting people. One such person was a friend of Janelle's, photographer George Rodriguez. This famed artist is known for his extensive coverage of Cesar Chavez and the Chicano movement of the late 60s. Perhaps I should approach Mr. Rodriguez about hiring him for some publicity shots of me? A man walked by and told me that he had enjoyed my comics. I inquired where he got them and he told me that he bought them in Janelle's shop and uses them in his Chicano Literature class at the nearby Whittier College! That one floored me, seriously. I thanked him and gave him my contact info, offering to speak to speak to his class if he ever wanted me to. Later, a young woman came by and told me she teaches a high school Latin American Literature class. I suggested to her that if she'd like, I could speak at her class too! She took my info and was going to see if she could get the school to buy some Muerto comics! Another woman, Tina, turned out to be a real delight to talk to. She told me that she was recently becoming very interested in Mexican art and culture. She spoke fondly of reading LOVE & ROCKETS back in the 80s, and I informed here that the Bros. Hernandez were indeed still creating their legendary comics. Then there was Dave, a guy bar-hopping with his friends who stopped by my table. They were looking for more Budweiser, and Dave, wearing a DAWN OF THE DEAD T-shirt and tattooed with Darth Vader, decided to pick up my comics. It wasn't long before we started talking about comics, old 1970s Marvel Comics. Dave is such an enthusiastic comics fan, and was soon going on about The Orb, Ghost Rider and Don Perlin! A good friend of mine, Janelle Gonzalez, called me on friday to ask if I would like to join her at a local event, the 4th Annual El Monte Arts Festiva, which was held this past saturday. Yeah, it was pretty last minute, but I decided that it would be a good chance to do some promotion, and maybe sell some books! El Monte is a city north of where I live, probably about 15 minutes away. Janelle owns a bookstore here in Whittier, so she was exhibiting as a vendor. For me, it was nice to be able to just show up at a gig, as oppossed to having to arrange my own table and such. I just brought my supply of books and set up shop. Another guest of Janelle's was our mutual friend, Lalo Alcaraz, the cartoonist who does the nationally syndicated strip La Cucaracha. Lalo and I were the only cartoonists there, the majority of the artists were painters and jewelry makers. The show had a real nice 'local artists' feel, with most of the art displaying a Mexican cultural feel, reflecting the make-up of the community. It's funny, when I got to the auditorium where the festival was held, I was suprirsed to see my friend Martin Espino performing up on stage! Although, Martin does these type of performances for a living. He builds his own instruments, such as water drums and all kinds of wind instruments. In fact, I met Martin back in April of '05, through a signing hosted by Janelle's shop. Martin's skills in pre-Columbian language and music were actually put to good use in the Muerto movie. I'm glad I was able to bring him onboard. Our director and film composer really enjoyed using his trememdous talents. One thing I've always been fortunate to experience with my comic is that I can exhibit equally at comics show as well as more culturally centered events like this one. And now with the El Muerto movie, I've got an entry into the world of film, such as my appearance last week at the Los Angeles Latino Film Festival. Versatility has always been a hallmark of my publishing efforts. I don't think self-publishers look into enough alternate venues in which to expand their audience. 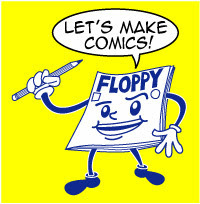 Of course we're all making comics, and want to get the attention of like-minded consumers. But how about reaching out to people who don't frequent comic shops and conventions? Everyone in the industry talks about trying to reach beyond the insular comics crowd. Depending on what type of book is created, the creator should think about the potential audience that might be interested in it. Just got my copies in the mail today. The second issue of a new Mexican mag called COMIC ZONE. Real nice magazine with glossy pages. I did this interview via email a little over a month ago. One of the editors, Lizbeth Carrasco, contacted me and it was a pleasure working with her. I really love that they did a whole two-page spread! The article mentions that as a U.S.-born citizen with Mexican roots, I created my own comic book inspired by American superheroes and Mexican culture. Also, they mention that I'm better known as 'Jav'! I wonder if Lizbeth must have read my Message Board? That's what a lot of the Boardies call me.... She sent me the questions in spanish, and with a little mix of my own spanish and an online translator, I replied in kind. Course, I asked Lizbeth if she would correct any grammar and punctuation, as I didn't wanna come off like a complete knucklehead! Note to everyone: online translators are not 100% accurate, so double check what is being translated! Lizbeth asked me if I could send her some signed comics so they can give away in a promotion. The current issue of the mag is giving away some Alex Ross/Paul Dini signed JLA stuff. What I like about the mag is that it covers a good variety of topics. Mostly of the superhero variety, like CIVIL WAR, but they also have a nice feature on Frank Miller's 1986 Daredevil: Born Again as well as two whole pages on 1996's Darkclaw, that wierd DC/Marvel Amalagation comic about a Bat Man/Wolverine character! And of course they have coverage of manga. Also in the new issue, there's a feature on Mexican-born artist, Jose Ladronn, who currently draws the Hip Flask comic book. Obviously they don't have the complete access to the American comics companies, but I think it's cool that their readers are exposed to superhero stories that they may have missed out on. And I'm grateful that I recieved copies of the magazine. I did an interview for the Mexican edition of FHM and never saw it. Also, a year ago I did a quick interview for the Italian VOGUE (something a bout a Death Issue ?!) but never saw that. While I don't always get copies of every mag I get interviewed by, it would be nice to at least get the foreign editions. But this was a great experience, and I'm sure my mom is going to call the relatives in Mexico and have em hit the newstands. COMICS TO FILM panel wrap-up. Yesterday was the panel on COMICS TO SCREEN at the L.A. Latino International Film Festival and I had a great time. From left to right are Jaime Hernandez, me, moderator Alan Dybner, Javier Grillo-Marxuach and Marv Wolfman. Len Wein appeared moments after the panel started. 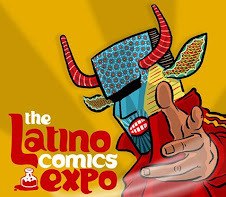 The thrust of the panel was Latino characters, and multi-cultural characters in general, appearing in comics. Len Wein, working as a writer for Marvel in the 70s, co-created the New X-Men with it's diverse cast of characters such as Nightcrawler, Storm and Colossus. Marv just wrote the direct-to-DVD animated movie of Condor, a Latino character created by Stan Lee for his own POW Entertainment. Jaime of course created the classic Maggie & Hopey from Love and Rockets. My nephew Christian accompanied me (he took the pics). I thought it would cool for him to see me in 'action', plus he'd have a heck of a story to tell his friends in school monday. After the panel he commented on how well all the creators got along. I thought that was cool because while all of us have very different positions and careers in comics, all of us love comics regradless if we're working for a mainstream company or an independent. But the mutual respect is there. Actually, I was the only guy on the panel that has a movie made out of a character that he owns. That's a big win for the self-published crowd! The key to a character's success is how well it's created, regardless of the group identification of the character. That was the consensus of the panel, and I certainly agree. However, I mentioned that I knew when I was creating El Muerto that there would indeed be an audience for a character with a Mexican background. Also, I felt that involving elements from Aztec mythology and the Dia de Los Muertos folklore would create a rich background that wasn't seen much in the comics world. Unless of course it was other Mexican creators like Carlos Saldana, Rafael Navarro and Rhode Montijo doing them! One of the audience members, appreciating the scope of creators on the panel, mentioned that if this panel was held at Comic Con there would have been a couple of thousand people in the audience. Looking at the panelists to the left and right of me, I would agree. Another audience question was "Why are there so many comic book movies being made today?". To which Jaime answered. "Because that's where all the good ideas are!"! Man, did I love that reply! Jaime also talked about how his own experiences with adapting Love and Rockets to film has varied over the years, but couldn't divulge any info on any current talks. Hmmm.... Soon as the panel was over I turned to Jaime and asked him to sign my GHOST OF HOPPERS hardcover. He mentioned to me that it was pretty cool that we had gotten some pretty good names on the movie. After the panel, I took some time to introduce myself to Marv Wolfman. Back in the late '70s, when I started reading comics, he had written some great runs on Amazing Spider-Man and Fantastic Four. He actually wrote the special 200th issue anniversary editions of each book (Spidey, Jan. 1980 and Fantastic Four, Nov. 78). I had to tell him that to this day I think those are the last really two great storylines for those comics, and in fact Marvel Comics in general. I religiously read Marvel for about another 7 or 8 years after that, but always fondly remembered those issues. He really captured what the characters were about and you can definitely read a continuity between his work, and the writers who preceded him, with that of original writer Stan Lee. He genuinely appreciated my comments. I did a couple of interviews after the panel. One was a documentary for the Festival itself, the other was for a popular local TV show call LA TV. It's a music show featuring spanish rock/Latino bands and has a great fan base with the youth market. I told them that I would love to go on the show and be a guest VJ! The just released Fall issue of LATINHEAT ENTERTAINMENT magazine has an interview with El Muerto producer Larry Rattner and a feature on Latino comics. 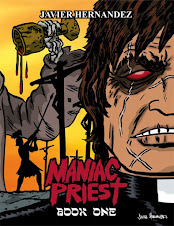 The story mentions Love & Rockets by Los Bros. Hernandez as well as interviewing Bruce Jones, the writer of DC Comics' EL DIABLO series from the late 80s/early 90s. Also weighing in with his words of wisdom are friend and now local neighbor, Rafael Navarro of Sonambulo fame. And yeah, I'm in there too! Here's a newsflash you don't see everyday! Subscribers to LATIN HEAT will be invited to attend a special screening of El Muerto coming up this month at the Screen Actors Guild. Info about the new issue and the offer is right here. 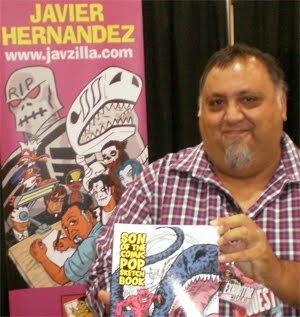 Jaime Hernandez, co-creator of the legendary LOVE AND ROCKETS series and one of the true pioneers of independent comics. Marv Wolfman, veteran comics writer of some of my absolute favorite runs on Amazing Spider-Man, Fantastic Four and Tomb of Dracula to name a few. Marv has written the script to Condor, an animated movie featuring a Latino superhero created by Stan Lee. Len Wein, another long-time comics writer for Marvel/DC including co-creating Swamp Thing, who went on to star in movies, a TV series and an animated series! Javier Grillo-Marxuach, the Emmy Award-winning writer of LOST, CHARMED, LAW AND ORDER, etc. He also writes a comic series he created for Viper Comics, THE MIDDLE MAN. That's a pretty cool panel, if you ask me! I will of course be sharing my own epic tale of how El Muerto went from indie comic to indie film. Any LA-area readers are invited to attend and lend their support. Admission is free! That's a panel I just inked. Still need to add the border to the panel, and erase some of the pencil and blue pencil. I'm currently finishing up EL MUERTO: DEAD & CONFUSED, PT. 1. Earlier this year I had released a Preview Edition of the book, and now I'm adding several pages to the story before I go to press with the final edition. I know I'll be tweaking some of the previous pages, things like dialogue and art touch-ups. But it will be great to finally have a new issue out! It's been about 12 days since I saw a screening of El Muerto. To have finally been able to see the completed picture was a big thrill. Although I had seen two screenings last November, they were a rough cut of the film. Now, having seen all the digital effects, scoring and all the sound and color corrections, I can say I am very happy with the final film. I always knew the actors we had in the film would really create a varied and rich cast of characters. But to experience the film as a complete production was very satisfying. Now of course, the film moves to the marketing and distributor stage. As word on that becomes available to share, I'll keep you all posted. I started working on my new comic last year, after filming on El Muerto had finished. So while the film was in post-production, the comic book was in production. Seeing the final film gives me a unique oppurtuntiy to see how the character and his world plays in a different medium. Collaborating on a film is just that, a collaboration. But since I created the source material, and crafted the entire comic book on my own, it was really amazing to see the property go through so many hands along it's path. With our director/writer Brian Cox providing the roadmap, everyone from the art departments to the wardrobe to the composer contributes to the vison, working together to bring the film to life. Brain would tell me that he was always dedicated to creating something that I would be proud of, and for succeeding with that he has my respect and admiration. From the beginning, he had to find the voice for the character and movie he created. So, I also got to play the role of the ultimate spectator from the inside. Experiencing the whole filmmaking process was rewarding in ways I wouldn't have even imagined from Day 1. Today I've spent the majority of the day inking pages. In the background while working I've played the director commentary for THE GODFATHER and APOCALYPSE NOW. Every time I hear the filmmaker commentary on a DVD, particulary if it's a big budget supehero movie or a classic American epic, I am amazed to hear these big films had the same obstacles we had on our movie. Not enough time, not enough money, pressure to get things done fast and cheap. At least we had no studio interference. We were independent and had to answer to no one. And by having the creator of the comic book onboard as one of the filmmakers, you keep things on the up and up! But what I learn from hearing Francis Coppola's tales of making his films is often useful and inspirational. How he finds the characters with the script and actors, or how he sells a scene with the emotion or psychology of how it's presented, these things are applicable to drawing and writing a comic. I'm always amazed when I hear the big comics publishers claim a new project is a 'blockbuster bursting with wide-screen action' or some other such hype. To look at a film and attempt to take the visual cues that you couln't possibly replicate on a comic page is counter-productive, in my opinion. With El Muerto, even though it's structured around mythological gods in it's premise, I've always felt that at it's core it's the emotional resonance people have to connect with to the character and his predictament. Film and comics are indeed visual mediums. And often, to varying degrees, each can have a literary foundation on which they are created. But the most memorable experiences for me, regardless if it's a film, novel, comic or music, is the emotional quality it has. Or the emotional reaction reaction I respond with, that makes the story worth watching, or creating.